EagleFiler is an easy-to-use information manager. It lets you organize and search mail, Web pages, PDF files, notes, and more. Use it to collect stuff from a variety of sources. Browse everything using a standard three-pane interface. Organize using folders and annotate using tags and notes, or just leave everything in one folder and pin-point what you need instantly using the live search. Since EagleFiler stores its library in Finder format, you can use it in concert with the other tools in your Mac ecosystem.
? Easy to install: just drag and drop a single application file. There?s no need to install a database engine, plug-ins, or script files to integrate with your other applications.
? Easy to use, with a familiar three-pane interface-lots of power, without lots of cluttered options.
? Makes efficient use of RAM and disk space.
? AppleScript support, for automation and integration with other applications.
? Can import any kind of file. EagleFiler has special support for displaying most common formats, and it can use Quick Look to display the others.
? Just press a hotkey while in another application, and EagleFiler will intelligently import the Web page, mailbox, or file that you?re currently viewing.
? Press the Quick entry hotkey to create a new file in EagleFiler from any application.
? Store Web pages in the following formats: bookmark, PDF, PDF (single page), plain text, rich text, rich text with images, Web archive.
? Import from any application by printing and choosing Save PDF to EagleFiler or by saving a file into EagleFiler?s To Import folder or directly into the library?s folder structure.
? Move or save new files directly into the library folder, and EagleFiler will auto-import them when it does a Scan for New Files.
? Import Web pages using bookmarklets.
? Automatically import scans by setting your scanner software (Fujitsu ScanSnap recommended) to save its files in the To Import folder.
? There are many other ways to import (e.g. drag and drop, services) so you can choose whatever?s easiest for the task at hand. Hold down the Option key when importing, and you can choose where to save the file and add tags, notes, and other metadata.
? Automatically detects duplicate files to save disk space and help you see what?s already been imported.
? First-class support for archiving e-mail. 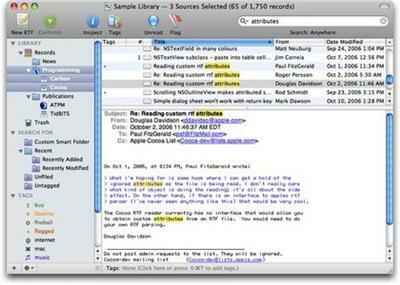 EagleFiler understands the content of messages and treats them as mail rather than as text or RTF files.
? Import the selected mailboxes or messages simply by pressing a hotkey in Apple Mail, Entourage, Mailsmith, Outlook, or PowerMail.
? EagleFiler retains the full message data, including attachments, read/flagged/replied status, and MailTags, so nothing is lost when moving mail into EagleFiler.
? Speed up your mail program by moving older messages to EagleFiler.
? Messages are efficiently stored using the standard ?mbox? format and can be imported back into any mail program if desired.
? You can also store messages as individual .eml files, for Spotlight searchability, and you can freely convert between the .eml and mbox formats.
? Can display messages as plain text (with colored quote levels and clickable links) or as HTML.
? Extract and convert your e-mail from Microsoft Outlook (or another proprietary mail client format) into standard mbox or .eml files.
? EagleFiler supports multiple libraries, stored wherever you want (hard disk, iDisk, iPhone, iPad, iPod, USB drive, etc.).
? You can open more than one library at a time, and more than one window per library.
? Files can be organized with folders and tags, both of which can be nested.
? Use the Go menu to quickly jump around to viewing different parts of your library.